Even traffic reporters have a little trepidation about the 495 Express Lanes. At the same time, here's a little advice ahead of their opening on Saturday. 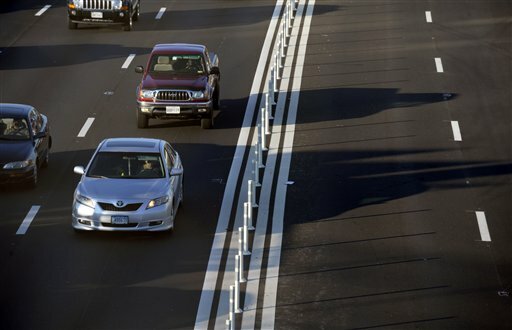 WASHINGTON – Like most people who drive in the D.C. metro region, I have been excited yet somewhat confused by the prospect of the new Capital Beltway Express Lanes that are scheduled to open this week. What I’ve found is that the best analogy may be riding an express train on the New York City subway or a Northeast Corridor Amtrak Acela train. The lanes are not there to expedite your trip to all exits on the Beltway. They are there for specific exits only, so you must plan where you will enter or exit. From the Beltway you can only get in or exit the Express Lanes north of Dulles International Airport in the Tysons area or south of Braddock Road in the Springfield area. In other words, once you are in the Express Lanes, you can only take the designated exits between those two points, you can’t get off and on the regular Beltway lanes. There is a distinct difference between the Express Lanes and the High Occupancy Vehicle lanes. HOV lanes are just that, designated lanes for vehicles with a minimum of two and sometimes three passengers. In our area HOV lanes are free of charge. The new Express Lanes are a “pay as you go” system that will carry different rates depending on the distance between the points you travel, much like Metro. There will be signs at all entry points with fares posted. If you are carpooling or have at least three passengers in the car, you can ride for free in the Express Lanes with an E-ZPass Flex transponder. The “Flex” is a modified version of the E-ZPass and allows two different settings, one for carpooling and one when there are fewer than three people in the car. All vehicles traveling in the Express Lanes must have an E-ZPass or E-ZPass Flex. Many people have voiced concerns about how these lanes will be plowed in snowy weather, but rest assured the Virginia Department of Transportation does have a solid plan in place. The plan includes high-pressure flush trucks to remove snow around the bollards that separate the express and main lanes. In the main lanes, the plowing will be done with a line of trucks all at once so that snow can be pushed to the right side since the Express Lanes are now on the left. Though it remains to be seen what effect these lanes will have on our daily traffic volume, we can be hopeful that the months of suffering through major construction will pay off. How many times have you said to yourself while sitting in a terrible traffic jam,” I would pay whatever it takes to get out of this and get home!”? The Express Lanes offer the chance of escaping that terrible jam as long as you’re willing to pay for it. The Express Lanes are scheduled to open Saturday, Nov. 17. The 495 Express Lanes website has detailed information on how to use the lanes. Of course, WTOP wants to hear how much you like or dislike the lanes. Tweet @WTOPTraffic with your thoughts. Follow @WTOPTraffic and WTOP reporters on Twitter.